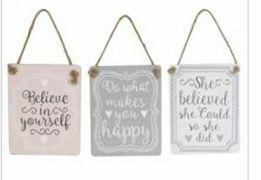 They are a lovely inspirational gift and send a lovely message to the recipient. Each have a little bit of rope in which to hang them. Please note that price is per plaque and not for all three. Please select from the drop down menu which saying you would like.